Methylammonium lead halide perovskites have been reported to be promising candidates for high-performance photodetectors. However, self-powered broadband ultraviolet-visible-near infrared (UV-Vis-NIR) photodetection with high responsivity is difficult to achieve in these materials. Here, we demonstrate, for the first time, a novel trilayer hybrid photodetector made by combining an n-type Si wafer, TiO2 interlayer and perovskite film. By precisely controlling the thickness of the TiO2 layer, enhanced separation and reduced recombination of carriers at the Si–perovskite interface are obtained. 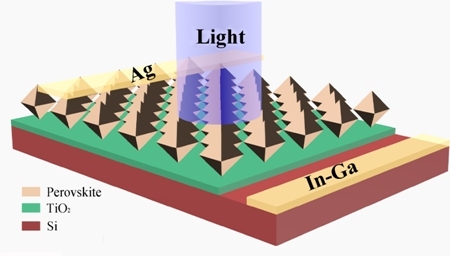 As a result, perovskite film, when combined with a low-bandgap Si, extends the wavelength range of photo response to 1,150 nm, along with improved on/off ratio, responsivity, and specific detectivity, when compared to pristine perovskite. Results obtained in this work are comparable or even better than those reported for perovskite-based UV-Vis-NIR photodetectors. In particular, the hybrid photodetectors can operate in a self-powered mode. The mechanism of enhancement has been explored and it is found that the increased separation and reduced recombination of photogenerated carriers at the junction interface leads to the improved performance. 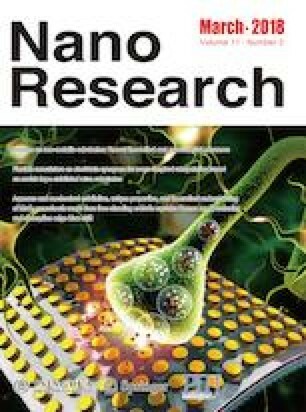 Fengren Cao and Qingliang Liao contributed equally to this work. Supplementary material (SEM images, XRD patterns, I–V curves of the pristine Si, perovskite, and TiO2/Si photodetector, comparison of the characteristic parameters) is available in the online version of this article at https://doi.org/10.1007/s12274-017-1790-1. This research was supported by the National Natural Science Foundation of China (Nos. 51672026, 51422206, 51372020, and 51372159), the National Key Research and Development Program of China (No. 2016YFA0202701), the Major National Scientific Research Projects (No. 2013CB932602), 1000 Youth Talents Plan, 333 High-level Talents Cultivation Project of Jiangsu Province, Six Talents Peak Project of Jiangsu Province, Distinguished Young Scholars Foundation by Jiangsu Science and Technology Committee (No. BK20140009), and Funded by the Priority Academic Program Development of Jiangsu Higher Education Institutions (PAPD).